A Cake Bakes in Brooklyn: Pie Contest on Saturday! Here's an idea for all you pie-loving New Yorkers out there -- come to the Daisy Pie Contest at 4 p.m. tomorrow (July 23rd) at the Brooklyn Kitchen in Williamsburg. The $5 ticket (all proceeds go to the Greenpoint Soup Kitchen) will get you a taste of the entries -- 40 sweet pies in all. The first, second and third prize pies will be judged by baking experts, but the Grand Prize can literally be bought. For just $1 per vote, you can vote early and often for your favorite (all proceeds go to charity). So bring lots of money and vote! 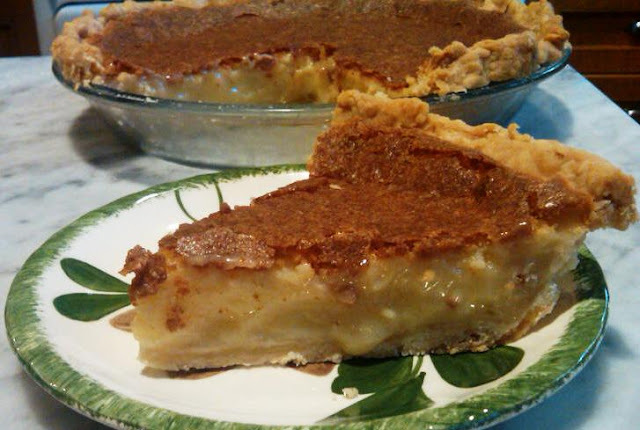 And I wouldn't mind if you all cast a few ballots for my entry, a buttermilk pie. I love the idea of this pie with buttermilk! If I lived in NY I would definitely go and vote for your pie! This is a great blog and your idea of going through old recipes and bringing them back to life is genius. You've inspired me to go through my grandmother's handwritten recipes and mine up some old gems! Thanks! Thanks, SugarBeam. Let me know if you discover any gems in your grandmother's recipes! What Happened at the Pie Contest?